Remember how October was the month of All The Video Games? This is no longer true. 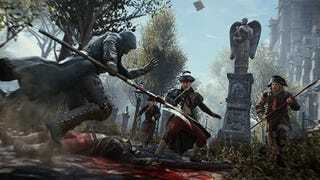 Assassin's Creed Unity will now be out on November 11, Ubisoft said today. That's a two-week bump for the upcoming action game. "This being a fully next-gen game, it requires a lot of work, a lot of production, and a lot of learning," Unity senior producer Vincent Pontbriand said on Ubisoft's blog today. "It's always hard to be precise and to quantify exactly how much work is involved. So as we get close to the finish we often realize we're near the target but we're not quite there yet." This follows a string of October delays including Evolve (October -> February 2015), Battlefield Hardline (October -> early 2015), and Dragon Age Inquisition (October -> November). I assume this is because everyone listened when I said October was an insane month for video games.